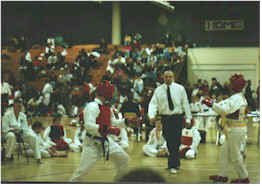 The next KATU-ITF Regional Colored Belt Championship will be held this April, 2000 at Bulkley High School in Hartford Connecticut. Children and Adults all levels to Rec. Black Belt Compete in Pattern, Free Sparring, Board Breaking Competitions... More information will be posted as it becomes available. Please contact KATU if you have any questions.